It is remarkable to me that two palaeontologists share this birthday (11th March). Both are connected in someway to Bristol, England and to the University of Adelaide and both have published papers on the Cambrian fossils of South Australia and the Cenozoic marine mollusc fossils of South Australia. 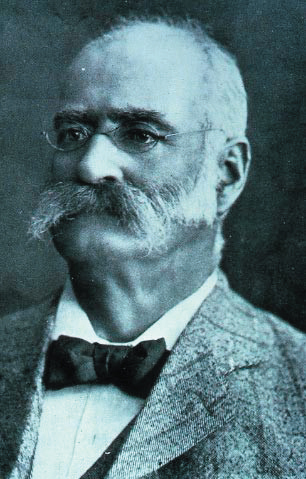 One of the two, Professor Ralph Tate (1840-1901), is a bit of a hero of mine and probably everyone else who has an interest in the evolution of Australia’s marine mollusc fauna. Since many of you may not be familiar with him I’ll give you a short bio here. He was born in Northumberland, England and was the son of a science and maths teacher. He studied geology from an early age (begining at 12) and was appointed senior science master in the Trade and Mining School at Bristol before his 25th birthday. By the age of 24 he was curator of the Geological Society of London. After a stint as a technical officer for a mining company in Central and South America he took up the position of Elder Professor of Natural Science at the University of Adelaide in 1975, where he went on to assist in the founding of the Adelaide Philosophical Society and the Royal Society of South Australia. He also had a strong interest in botany as well (having published on the flora of the Shetlands before leaving England for South Australia) and travelled extensively throughout Australia, collecting plants, minerals and fossils. Major acheivements include being the first to recognise ancient glacial pavements at Hallett’s Cove, South of Adelaide (these are now known to be part of a major ice-age that struck Gondwana during the Late Carboniferous and Early Permian while our early tetrapod ancestors lolled about in coal swamps to the north) and being the first to recognise and publish on the Cambrian sediments on York Peninsula (still one of the best sources of Early Cambrian small shelly fossils in the world). But it is for his pioneering work on the marine Cenozoic faunas of southern Australia that I know him best. He single handed described 626 marine invertebrate fossil species in a series of more than 15 monographs and papers. I was extremely honoured when in 1994 I recieved the Tate Medal, a prize awarded to the best honours research project of the year, for a graduating student of the Department of Geology, University of Adelaide. So who is the second palaeontologist with this birthday? oh that’s me. So last time the count-down had reached number 6. Now lets finish this little series off with the top five largest. Once again the measurements are femur lengths. Our newly described taxon was not small. We only recovered the femur of the smaller individual but scaling to the larger of the two individuals gives an estimated femur length close to that of the type specimen of Euskelosaurus. Assuming a more nearly circular abdomen than in Plateosaurus leads to a mass estimate of somewhere between 1300 kg and 1575 kg, with a mass of 1450 kg seeming quite reasonable. Thats about the mass of an average white rhino; not supergiant by dinosaur standards but respectable enough. However bone histology showed clearly that it was still an actively growing juvenile despite its size. Who knows how big an adult Aardonyx got? The type specimen of Sinosaurus is a small fragment of maxilla bearing large, blade like teeth that are typical of carnivorous archosaurs. Given the early Jurassic age for the lower Lufeng Formation, this maxillary fragment more than likely came from a large theropod. Whether or not it is diagnostic, I don’t know. Anyway the typically sauropodomorph postcranium attributed to it clearly does not belong to Sinosaurus. Just what it is is uncertain, it has been referred to as an unnamed melanorosaurid, or another specimen of Jingshanosaurus, but it may belong to a number of large, poorly known basal anchisaurian taxa present in the Early Jurassic of China (Yimenosaurus, Chinshakiangosaurus – if it isn’t a sauropod, or ‘Yunnanosaurus’ robustus). Whatever it is it is big. So now we get to the top three. 3. Plateosaurus engelhardti. 98 cm. This is surprising. The classic, medium-sized, dull-as-dishwater ‘prosauropod’ is actually one of the very largest known members of the group. The largest known specimen is the 98 cm long femur from the holotype of Pachysaurus wetzelianus which was found in the famous Trossingen quarry alongside lots of other Plateosaurus specimens. Its distinctiveness as a different genus and species is not well-founded and I’m happy to continue treating it as a synonym of Plateosaurus engelhardti. It is interesting to note that Plateosaurus is the most well-represented basal sauropodomorph with dozens of referred specimens. 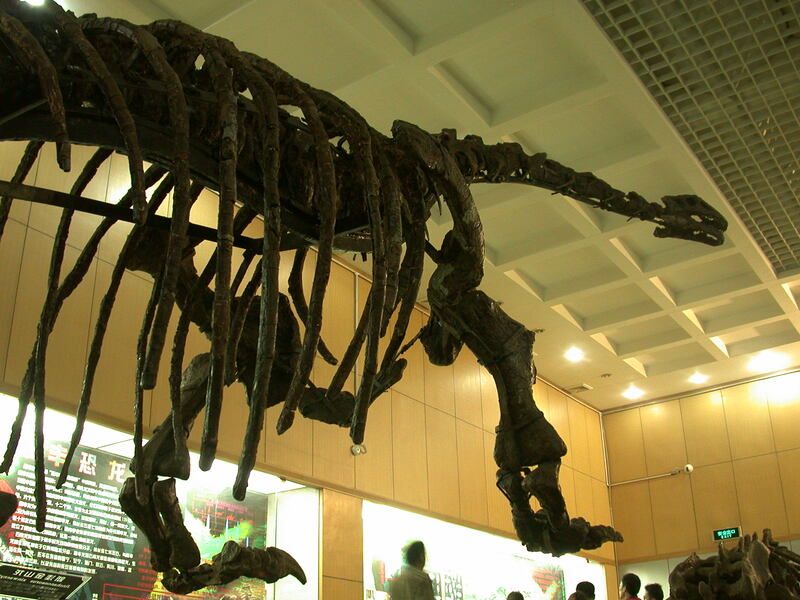 An average Plateosaurus is much smaller than the giant ‘P. wetzelianus’ specimen, so is its discovery related to the much larger sample-size available for this taxon? I would that yes, this is almost certainly so. Because all of the other taxa in this list are based on much smaller sample sizes (that in some cases include only juveniles) the biological meaning of this list is rather limited. Since this list is supposed to be arbitrarily restricted to non-sauropods, there is a good chance that this taxon does not belong in it. 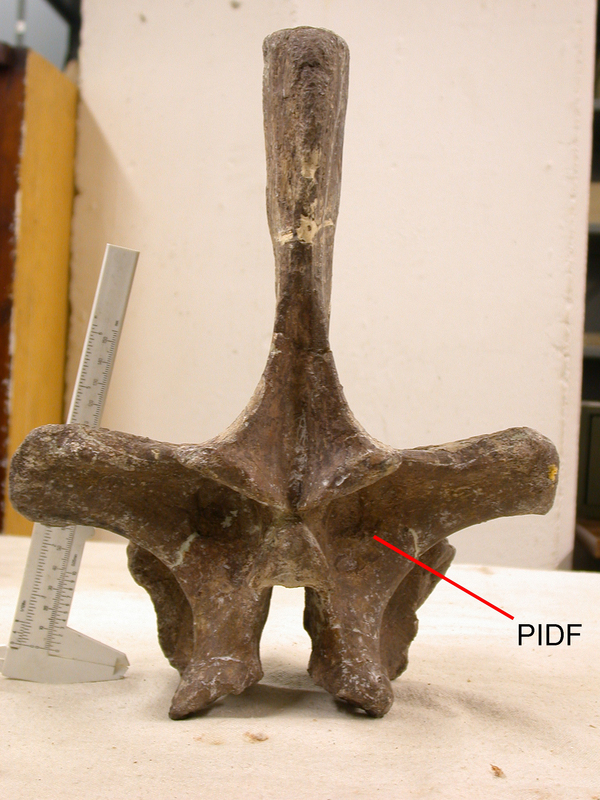 However there are some features, such as the unusually abbreviated mediolateral length of the femoral head, that could potentially indicate a closer relationship with Melanorosaurus than with Sauropoda. This is yet another surprising entry. Although no femur exists we have a pelvis and vertebral column. 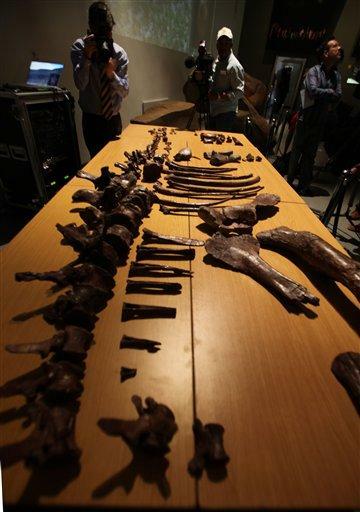 These bones indicate two things: 1) ‘Y.’ youngi wasn’t proportionately different from other, smaller basal sauropodomorphs and 2) It was exceptionally large with an estimated femur length of 110 cm in length (definately up there in small sauropod territory). Scaling up from Heinrich Mallinson’s model of Plateosaurus gives a rough estimate of about 3.5 tons for this beast, that is about the size of Shunosaurus or female african elephant. Certain things about ‘Y’ youngi are rather odd. Despite its size it seems to be less closely related to sauropods than other basal sauropodomorphs like Camelotia and Melanorosaurus. Indeed it may well have had the classic bipedal prosauropod body plan. It is also the only non-sauropod sauropodomorph that apparently survived into the Middle Jurassic. 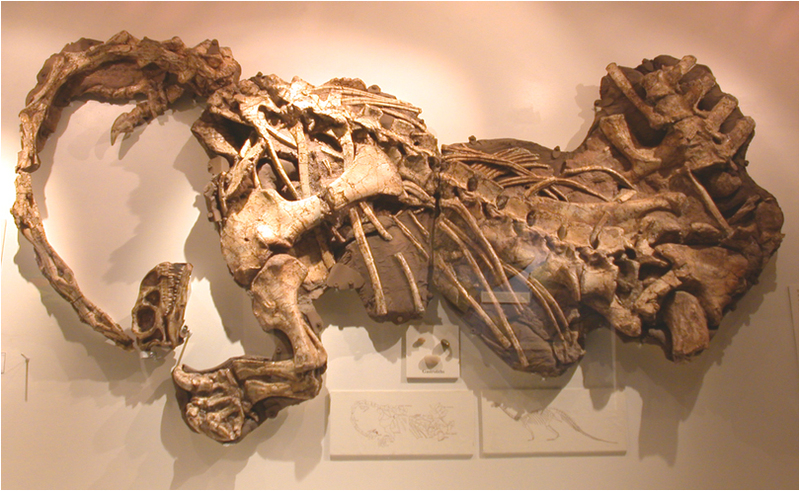 If you have an interest in dinosaurs you will have heard of Massospondylus. 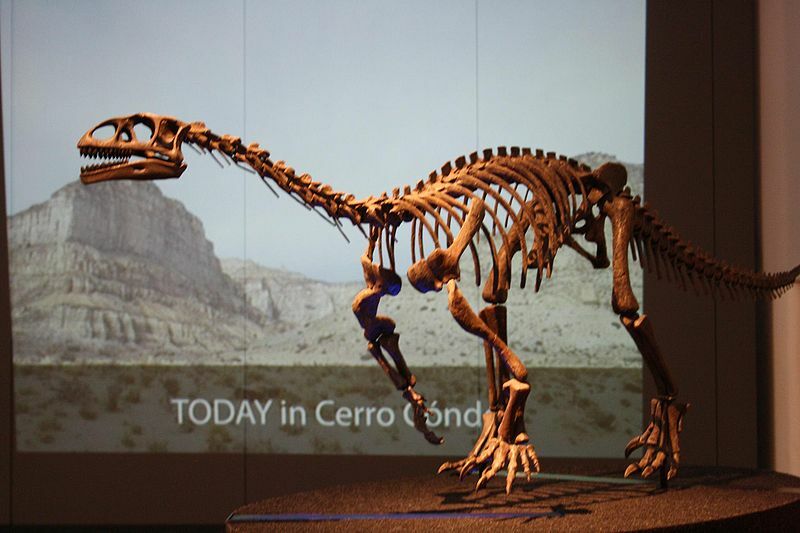 It appears in many popular dinosaur books, is regarded as one of the commonest dinosaurs in southern Africa, and has numerous nearly complete skeletons and skulls attributed to it. There are even fossil eggs with complete articulated embryonic skeletons inside that are thought to belong to this species. But what of the type specimen; the official name bearer of the species? When other specimens are referred to Massospondylus, specifically Massospondylus carinatus, we are proposing the hypothesis that the referred specimen belongs to the same species (whatever that is*) as the type specimen. As so often transpires, the name Massospondylus carinatus was coined early in the history of dinosaur studies, on material that, nowadays, we probably wouldn’t even bother to collect. What is the problem with Massopsondylus? Indeed the type specimens of Massospondylus carinatus are, or more correctly were, a paltry pile of damaged vertebrae that were collected off the surface of an outcrop on the Farm Beauchef Abbey, near the town of Harrismith in what is now the Free State Province of South Africa. A total collection of 56 postcranial bones from this site were donated to the Hunterian Museum of the Royal College of Surgeons in London. These were described by the famous anatomist, and creator of the name ‘dinosaur’, Sir Richard Owen in 1854. Owen selected five vertebrae from this collection as positively belonging to his new species Massospondylus carinatus. These five vertebrae then became the type specimens (when there is more than a single specimen we call them syntypes) of the species. Now this where a major problem arises. 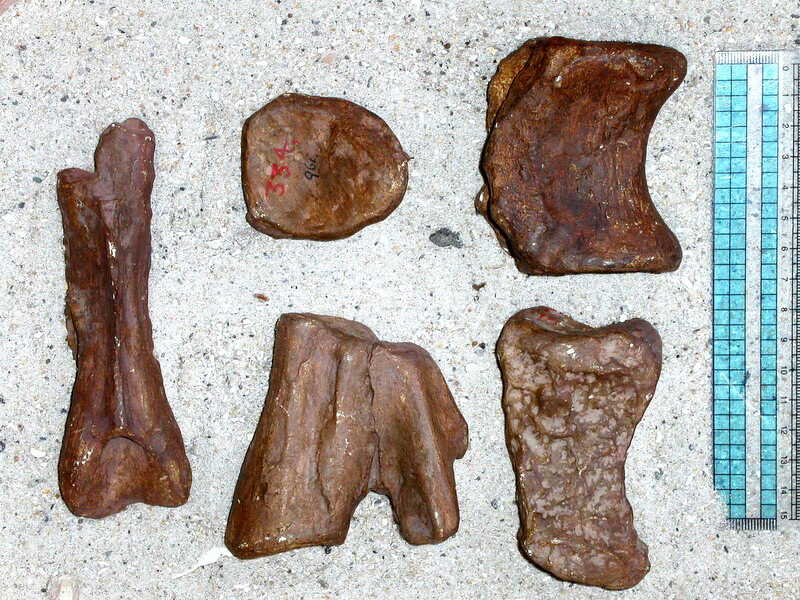 These vertebrae (we now know them to be neck vertebrae although Owen mistakenly took them for tail vertebrae) are no different from the neck vertebrae of a host of early sauropodomorph dinosaurs such as Adeopapposaurus, Coloradisaurus and Lufengosaurus. Of course tiny differences might be able to be picked out if one looked hard enough but these differences are likely to be subsumed by larger the range of variation seen between individuals of the same species. Furthermore there is more than one species lurking amongst the Massospondylus-like sauropodomorphs of the Early Jurassic of southern Africa. Massospondylus kaalae is one these, and there may well be others. Deciding which of these is represented by the types is impossible. So what to do? There are three courses of action: 1. Resurrect one of the old presumed synonyms of Massospondylus carinatus as a replacement name. There are certainly plenty of these but each and every one of them is based on material that is almost as inadequate as the original syntypes. 2. Invent a brand new name and apply it to one of the more complete specimens now known. 3. Designate a neotype: That is, take the name Massospondylus carinatus, decouple t from the syntype series and reattach it to one of the more complete specimens. The latter of the three options has the great advantage of causing absolutely no taxonomic disruptions that would ensue if a new and unfamiliar name were to be applied to this well-known taxon. Usually option three requires a petition to the ICZN, which is gazetted in their bulletin, subjected to public commentary, either for or against, and eventually voted on by the ICZN before final ratification or dismissal. This is a long, slow process but nevertheless the route that Paul Barrett and I favoured. So we set about preparing a formal application to the ICZN to designate a neotype for Massospondylus. Much to my surprise the application was turned down, not because the ICZN didn’t think we had sufficient grounds to justify the designation of a neotype but because a formal petition wasn’t required in this case. You see, in a twist of fate the original syntypes were destroyed during a German bombing raid over London during World War II. Nevertheless they were survived by a series of illustrations and plaster casts. Some more of the Beauchef Abbey collection preserved as these plaster casts held in the South African Museum, Capetown. I had thought these were sufficient to act as types, after all the types of Spinosaurus aegytiacus are now reduced to illustrations, thanks to an allied bombing raid in the same war. However they are not, and a neotype can be designated without petition to the ICZN. This is may be the only case where specimen destruction via bombing has actually helped the science a little bit. So finally our designation of a neotype has been published in Palaeontologia africana. The specimen we selected is a beaut – BP/1/4934, or ‘Big Momma’ as she is affectionately known. So Massospondylus has been saved, it is no longer in danger of being thrown away as yet another nomen dubium and will forever be one of the best known dinosaurs. Yates, A. M. and Barrett, P. M. 2011 (for 2010). Massospondylus carinatus Owen 1854 (Dinosauria, Sauropodomorpha): proposed conservation of usage by designation of a neotype. Palaeontologia africana 45: 7-10. *Species concepts in palaeontology are a whole ‘nother can of worms I’m not going to say too much about. Just that I personally prefer concepts based on the biological species concept, that is species are populations linked by interbreeding. So yes asexual organisms would not consist of species, just clades and that to recognise species in extinct populations we would have to use what little proxies for interbreeding as we can find. OK time to get the countdown started. The list is ordered by femoral length, or extrapoloated femoral length, mostly because good skeletal reconstructions from which volumetric estimations could be made are lacking. Nevertheless the strong similarity of the body plan of basal sauropodomorphs means that femoral length is a pretty good proxy for body size. We’ll count down the top ten taxa. Melanorosaurus readi with a maximum recorded femoral length of 63 cm. Yes, that’s right. The archetypal ‘big prosauropod’ is actually quite a tiddler and barely scrapes into my top ten list. Nevertheless the individual elements of this guy are quite heavy and robust which may have fostered the myth that this near-sauropod was generally bigger than Plateosaurus and its ilk. It probably only tipped the scales at 800 kg. Melanorosaurus reconstruction by 'steveoc'. Image from Wikimedia commons. I put commas around the genus name because no-one has proposed any good characters that might link L. magnus to L. huenei even though they are fairly universally treated as synonyms. They could be but I doubt it, there are some odd features of L. magnus that are not present in L. huenei and vice versa. 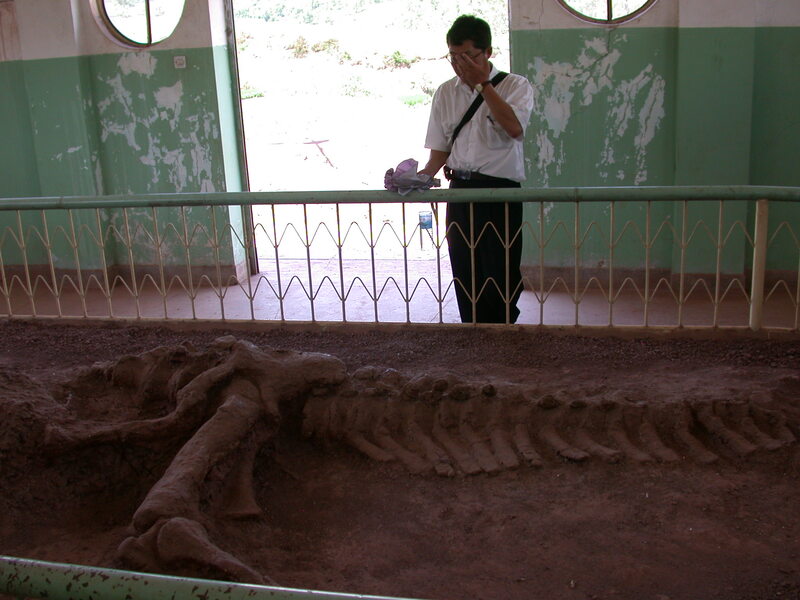 A partial skeleton of what might be 'Lufengosaurus magnus' left in situ on Dawa Hill, near Lufeng, Yunnan. Not the largest basal sauropodomorph by any means but it does include the largest nearly complete mounted skeleton of a basal sauropodomorph. This is the taxon that has been farly consistently confused with Euskelosaurus since the 1970’s. It isn’t. 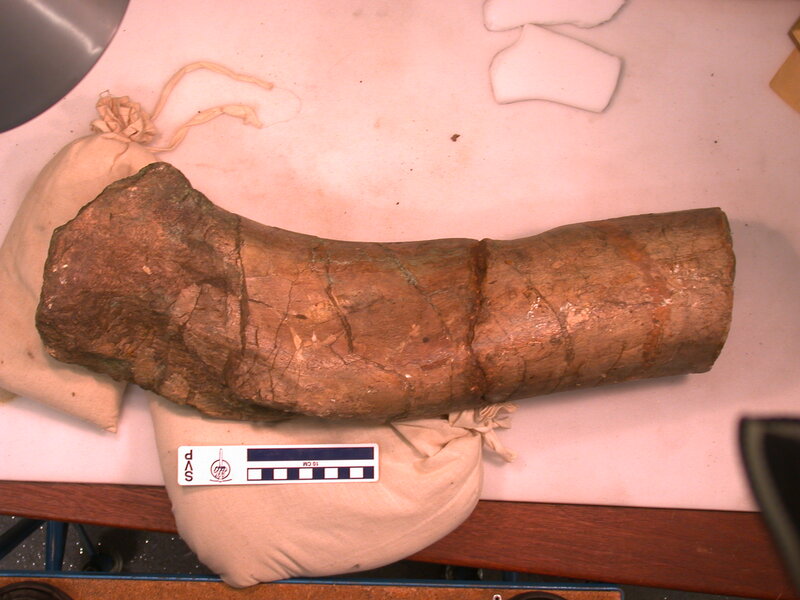 The known femora of Plateosauravus are not so big, but there are other bones included in the topotype collection that indicate that some members of this species got quite large. Scaling up from these bones we arrive at an estimated femoral length of 83 cm for the biggest individuals in the topotype bone bed. Based on other basal sauropodomorphs we can estimate that an individual with an 83 cm femur would have weighed in at 1.1 to 1.2 tons. Regardless of whether or not this is a nomen dubium the individual upon which the name was bestowed did exist, and was pretty large. Further it demonstrably didn’t belong to any of its well-known contemporaries such as Antetonitrus, Melanorosaurus, Eucnemesaurus or Plateosauravus so provisionally, I’m treating this as a valid taxon. So oddly enough places 10-6 consist entirely of taxa either from the Early Jurassic of China or the Late Triassic of South Africa. Another take home point is that a lot of these measurements are based on very limited sample sizes. Given the rather small differences between many of them it would be silly to treat this list as accurately reflecting the mean sizes of each of these species, or the top sizes that they reached. Nonetheless the very biggest on the list were in a real biological sense large animals than those from the bottom of the list. What were the top five? You’ll have to wait for part 3. A note on missing taxa. I could get only get skull measurements for Yimenosaurus, so it is not included. Chinshakiangosaurus, Antetonitrus and Lessemsaurus are arbitrarily excluded on suspicion of being sauropods. Recently I’ve been looking into the size of basal sauropodomorphs. Some of these guys reached really impressive sizes, and it wasn’t just the so-called melanorosaurids. Indeed two of the top three on my list are probably going to be a surprise to some. Pachysaurus? giganteus: the megaplateosaur that never was. Don’t be surprised if you haven’t heard of this guy. There is precious little written about it and precious little of it in the first place. The species was first coined by Friedrich von Huene (1932), the doyen of European plateosaur studies, for a cluster of long bones that he took to be part of an articulated metatarsus (the part of the foot that fits between the toes and the ankle). He tentatively placed it in the now defunct genus Pachysaurus (a synonym of Plateosaurus). They were found in the Trossingen Plateosaurus quarry, well known for its abundance of articulated Plateosaurus fossils including articulated skeletons as well as many dispersed isolated bones. The longest of these supposed metatarsals was a massive 52 cm long. To put that into some kind of perspective: the longest metatarsal of the larger individual of Aardonyx (itself a big basal sauropodomorph) is less than half as long. Indeed we can extrapolate from this a range of femur lengths for P. giganteus from 1.5 to 2 meters (depending on wether we give it a stumpy Aardonyx-like foot or a more elongate Plateosaurus-like foot). The upper end of that range is nosing into brachiosaur size territory. As appealing as the notion of Brachiosaurus-sized plateosaurs cruising around the Late Triassic might be, I’m afraid that it almost certainly wasn’t so. 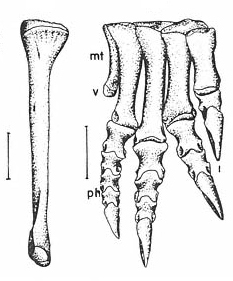 The specimens were re-examined by David Weishampel who found that they were not metatarsals at all, rather a cluster of three fibulae (Weishampel, vide Galton, 2001). Presumably they would have been brought together by current action, long after their respective carcasses had decayed and their skeletons dispersed. Such current sorting is not unusual. 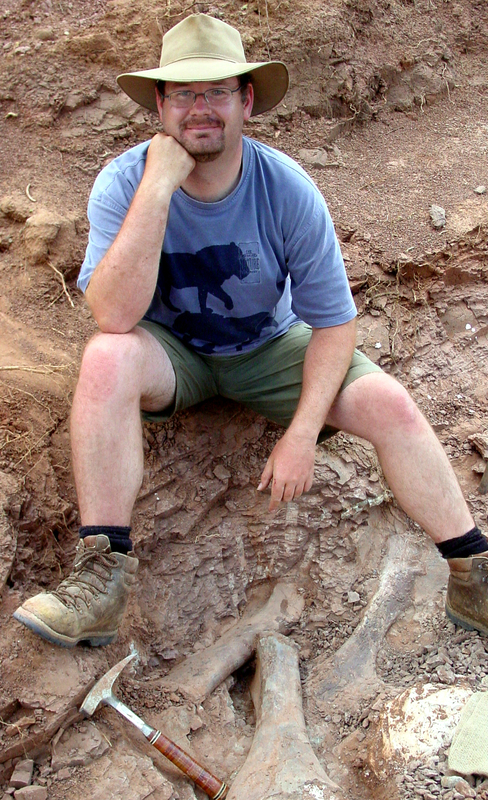 Here is a picture of me next to a little minicluster of tibiae in one of our Spion Kop quarries (no they are not Aardonyx bones). Now of course this kind of reassessment of bone ID makes me a little uncomfortable. Von Huene was no fool and to suppose that he mistook fibulae for metatarsals does strain credibility a little. On the other hand Weishampel is no fool either and the preservation of the P. giganteus bones is truly awful, obscuring their true identity. See for yourself. The original bones of 'Pachysaurus? giganteus'. Scale bar equals 5 cm. Image from Galton (2001, fig. 10). Admittedly the figure from the paper is not the best (anyone who has photos, or access to the collections in Tubingen want to send some images in?) but it should be immediately apparent that they are way slender for metatarsals, especially metatarsals that exceed half a meter in length. 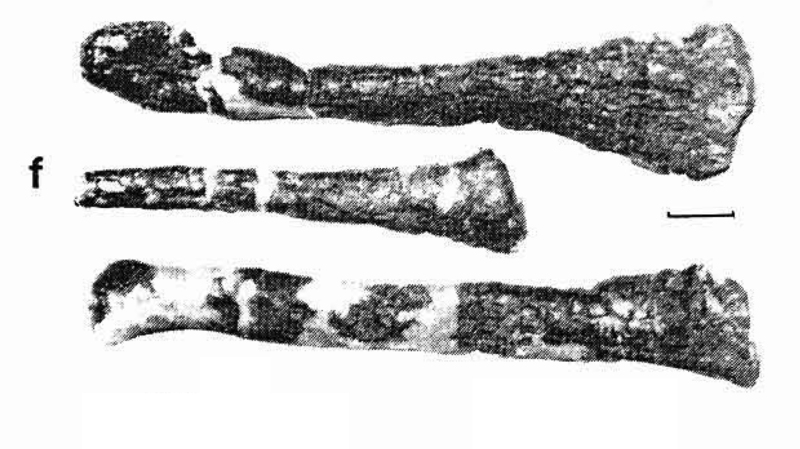 First compare them to known metatarsals of Plateosaurus (on the right) and a fibula of Plateosaurus (on the left). Not only do the bones of P. giganteus fit the size of an ordinary Plateosaurus fibula, the shape seems to match well. HUENE, F. v. (1932) – Die fossile Reptil-Ordnung Saurischia, ihre Entwicklung und Geschichte. Monogr Geol. Palaeont., (1) 4: 1-361. 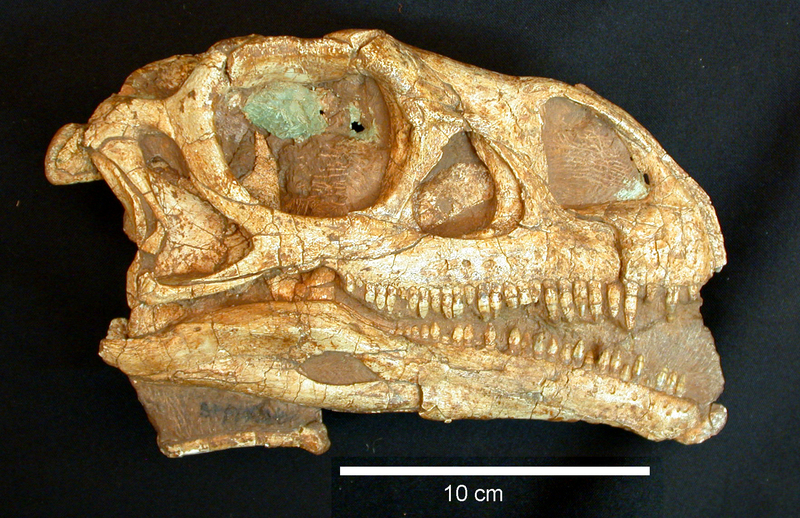 GALTON, P. M. 1990 – Basal Sauropodomorpha–Prosauropoda. 320–344. In WEISHAMPEL, D. B., DODSON, P. and OSMÓLSKA, H. (eds). The Dinosauria. University of California Press, Berkeley, 733 pp. 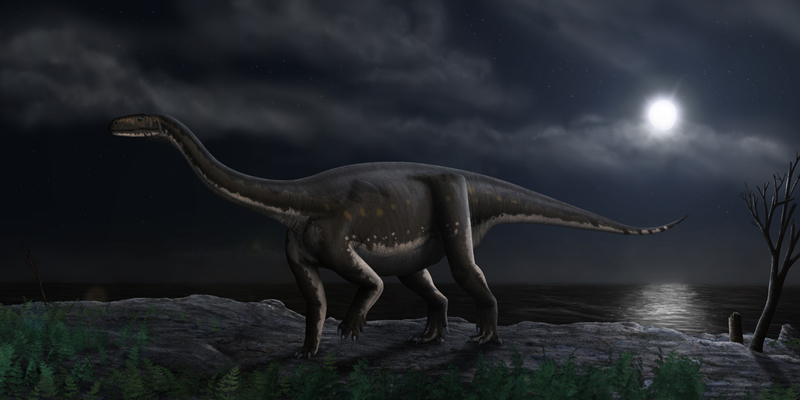 GALTON, P. M. 2001 – The prosauropod dinosaur Plateosaurus MEYER, 1837 (Saurischia: Sauropodomorpha; Upper Triassic). II. Notes on the referred species. Revue de Paléobiologie, Genève, 20: 435–502. In the background, between the flurry of new ceratopsian papers and the normal constant rain of theropod research, there has been a marked uptick in the number of basal sauropodomorph (‘prosauropod’ if you want) papers over the last couple of years. Simply in terms of new taxa we’ve had Panphagia, Massospondylus kaalae, Aardonyx, Seitaad, Sarahsaurus, Chromogisaurus, Ignavusaurus, Xixiposaurus, Chuxiongsaurus as well as the admission of an old favourite, Eoraptor, to the ranks. And now we have one more; Leonerasaurus traquetrensis. Its an interesting little beast, with some quite advanced sauropod-like characteristics packaged in quite a lithe, small body. One stand-out feature is the number of vertebrae joining the pelvis to the spine (sacral vertebrae). Most basal sauropodomorphs had three such vertebrae, whereas the large sauropods have at least four, usually five or or more. Leonerasaurus is like a sauropod with four vertebrae joining the pelvis. 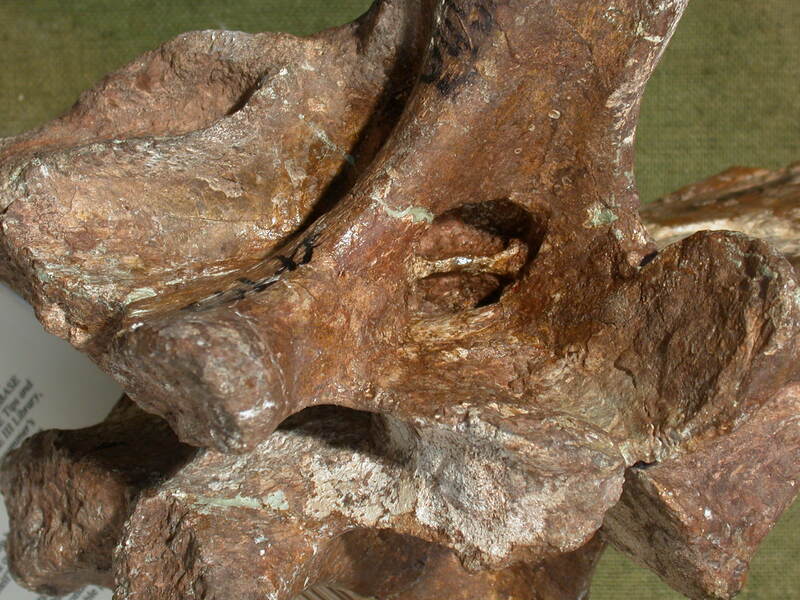 The extra vertebra has been recruited from the base of the tail. One might think that this extra bracing was related to weight support for increasing size as these sauropodomorphs edged closer to gigantism and ‘sauropodhood’. But not so, Leonerasaurus is rather small (bone histology confirms that the skeleton was of an adult), and a reconstruction of ancestral body sizes based on the authors’ own cladistic analysis shows that the aquisition of the extra sacral vertebra happened before the big spike in body size on the lineage leading to sauropods. In other words one more feature characteristic of later gigantic sauropods has been shown to have evolved long before they were giants. Another aspect that is becoming a theme in early sauropodomorph evolution is rampant homoplasy (messy evolution that involves either convergent evolution of characteristics or reversal back to the ancestral state). Pol et al. find that Leonerasaurus is really quite derived actually slotting in between Aardonyx and Melanorosaurus on their cladogram. That makes sense in the light of the increased sacral count and a few other very ‘sauropody’ features, such as the spoon-shaped front teeth, but much less sense when you look at the primitive low neural spines of the dorsals and the slender metatarsal of the first toe of the foot. Hence the massive sauropod-like foot of Aardonyx (that bore the bulk of the weight on the inner digits) was not present in this guy. Did it reverse in Leonerasaurus or is it convergent in Aardonyx and sauropods? Another option is that Leonerasaurus is simply in the wrong place. Indeed it does share some features with a more basal early sauropodomorph familiar to many: Anchisaurus. 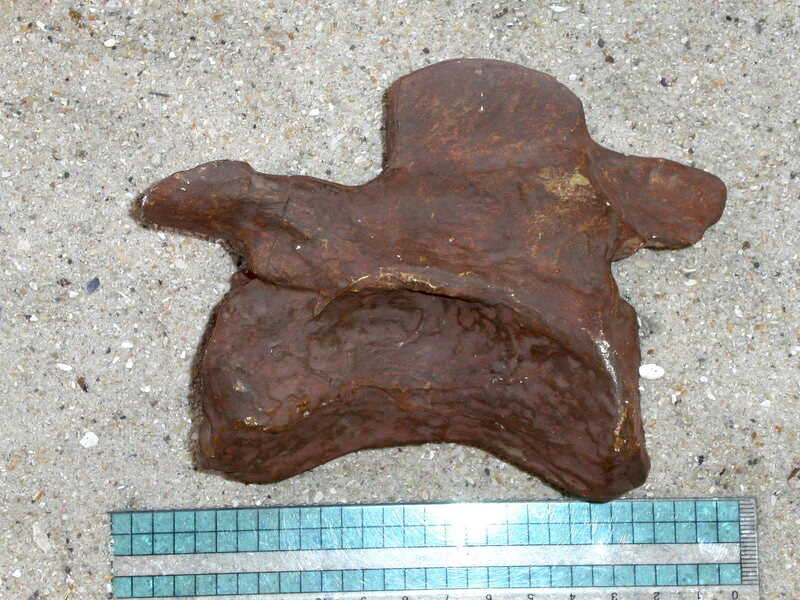 These include a long, spine-like process sticking out of the front of the ilium in the pelvis (it is short and triangular in other basal sauropodmorphs) and quite slender sacral ribs. So is Leonerasaurus a sister taxon of Anchisaurus that has picked up some sauropod-like characteristics convergently? That would have been my guess but its an hypothesis that the authors directly tested and no, trees that enforce such a relationship are significantly longer (=significantly worse explanation of the data) than those that place it up as the sister to what I call the quadrupedal clade (Melanorosaurus + Sauropoda). Of course who knows what future observations may bring? I’m writing this before the embargo breaks so I cannot provide a link to the paper. However if you want to see it just head on over to PloS ONE and you’ll find it.